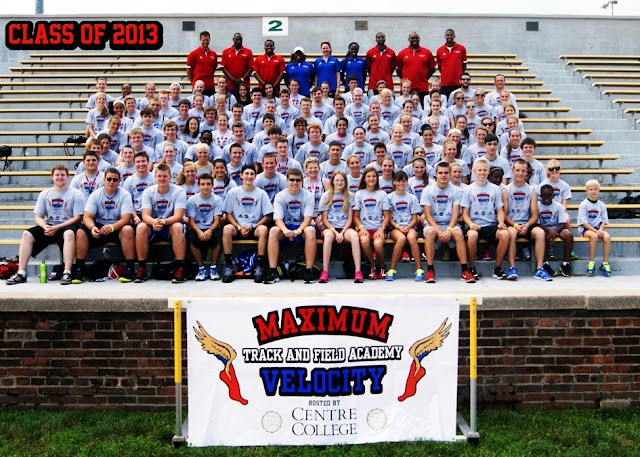 When we started the Maximum Velocity Track and Field Academy 3 years ago, our vision was to help rejuvenate the sport of track and field by bringing in some of the best athletes in the world to work with our campers. Our campers not only learn the technical aspects of their event by working hands on with our clinicians, they also learn how to mentally prepare themselves to be the best they can be, because our clinicians have competed on the biggest stages in our sport. There is no other camp like us in the nation. The 2013 Academy was our most successful to date, and we would like to take this opportunity to say thanks to all of those who helped us make it possible. We would like to say a big thank you to our campers, and their parents for choosing our camp. Without you, there would not be a Maximum Velocity Track and Field Academy. This year our campers were 59% female, 41% male, and came to us from 13 states! We hope you looked over your shoulder as you left campus thinking you had a great time, and that you want to come back next year. Thank you for your willingness to give back to the sport by coming to our camp, and working with our young athletes.This is an amazing opportunity for them to learn, and we hope it is a rewarding experience for you as well. Thanks to the Bluegrass State Games for your partnership with our camp. This was an amazing way to conclude camp, and we hope to continue this partnership in the future. A special thanks to our sponsors, Adidas and the KTCCCA, for helping us offer this one-of-a-kind opportunity for our campers. We appreciate your trust in us to provide an experience for young track and field athletes that we hope you are proud to put your name on. Thank you to Centre College for allowing us to use your amazing facilities. A special thanks to Larry Vaught at the Advocate Messenger in Danville for all of the publicity you do for our camp. We would also like to thank Alex Risen from ABC36 News in Lexington for your spots on the camp. We are currently wrapping up the loose ends of the 2013 Academy. Please continue to check back with us to see pictures that we will be posting over the next few weeks, and to get information on the 2014 Maximum Velocity Track and Field Academy as it becomes available.